Submit your full paper or abstract via the Electronic Submission System now! 2019 4th International Conference on Information and Network Technologies (ICINT 2019) aims to provide a forum for researchers, practitioners, and professinals from the industry, academia and government to discourse on research and development, professional practice in information and network technologies. ICINT 2019 will be held in Suzaku Campus, Ritsumeikan University, Kyoto, Japan during May 25-27, 2019. ICINT is also the annual meeting of JACN editorial board, so it also serves to bring authors and editors of JACN together to communciate face to face and discuss chances for possible cooperation and future development of JACN. Option 1: Publication in Conference Proceedings. Submissions will be peer reviewed by conference committees, and accepted papers will be published in the conference proceedings, which will be indexed by EI Compendex, Scopus, etc. Option 2: Publication in Journal. 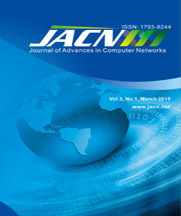 Submissions will be reviewed by the conference committees and journal editorial board, and accepted papers will be published in Journal of Advances in Computer Networks, which will be indexed by EI (INSPEC, IET), Electronic Journals Library, Ulrich's Periodicals Directory, ProQuest, and Google Scholar. etc. Option 3: For those who're NOT looking to publish their papers, it's acceptable to submit your abstracts to the conference just for oral presentation without publication, which will be sent to at least two techinical committees for a brief review, and it will take about 10 working days. March 16, 2019, News ! Final call for papers. The submission deadline has been extended to April 10, 2019. (Click). August 5, 2018, News ! ICINT2019 will be held in Ritsumeikan University, Kyoto, Japan during May 25-27. The submission is open now.' (Click). ICINT 2018 has runned smoothly during May 24-26 in Osaka, Japan. We thank every participant for your support. Hope to catch you again next year (Click).